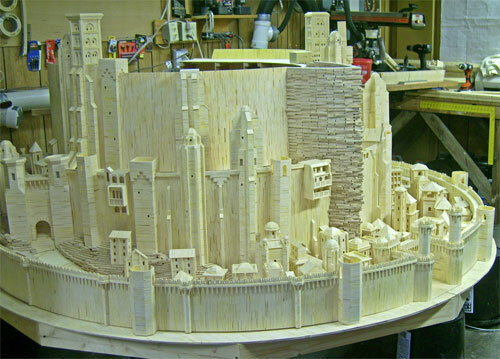 Just when you thought the DIY wonders stopped at Popsicle Stick Viking Longboats and the Matchstick McLaren, this guy goes and immortalizes Minas Tirith in more wood. The Iowa artist responsible plans on completing this not-so-hobbit-sized Lord of the Rings tribute by 2009. It already looks amazing! 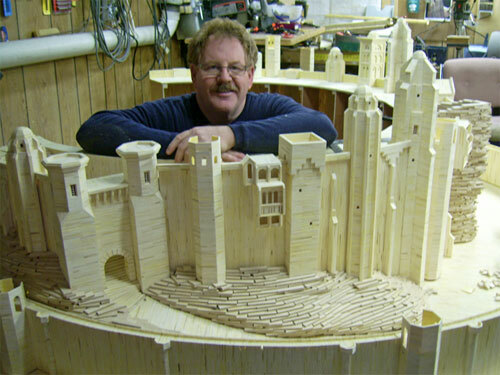 This guy obviously has talent — I’m calling for a scale replica of the Death Star in matchstick form next. Good luck to Patrick in getting this project finished in the future. A few more images can be found here.